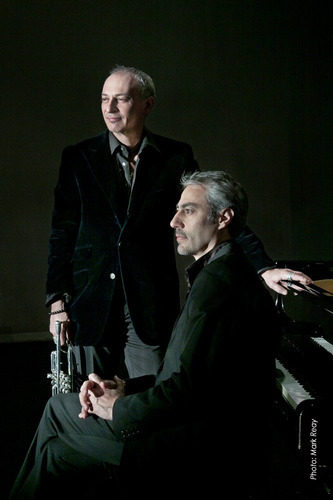 If you walk into the Timucua white house on Sunday, April 7th after Benoit Glazer’s almost certainly extemporaneous opening announcements, you might mistake trumpeter Brian Groder and pianist Tonino Miano’s concert as the next effort of the cm5. 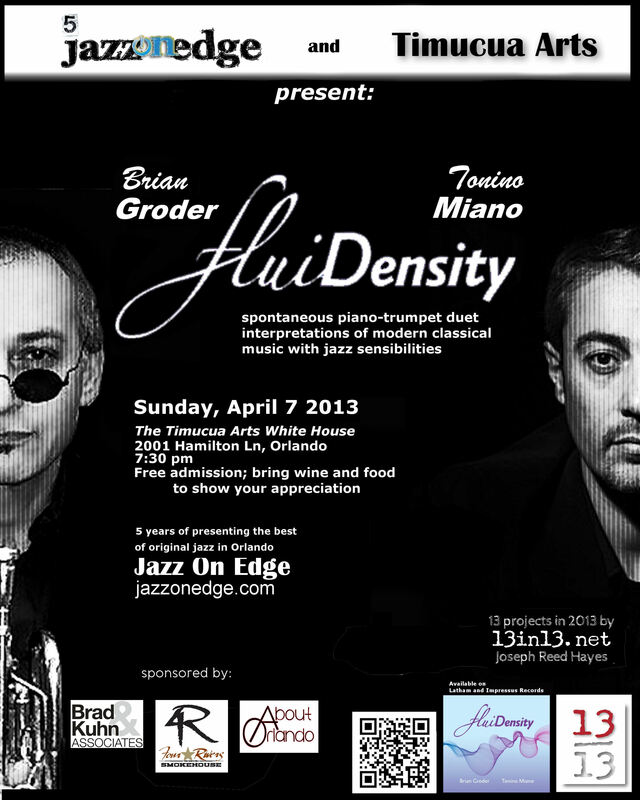 It will be the closing bookend of the fifth annual Jazz On Edge event in Orlando. Producer Joseph Hayes has brought in the New York-based trumpeter to his third Jazz On Edge following his pairing with the Sam Rivers Trio for the recording of the fine Torque CD. 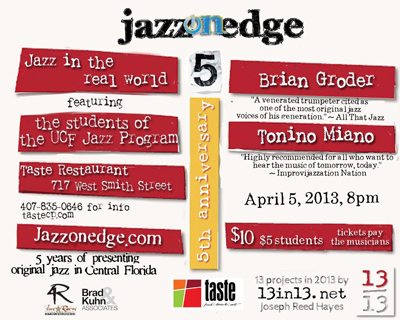 Groder’s forthcoming visit brings pianist Miano for a visit to UCF’s Jazz Studies class for a workshop on improvisation followed by a live communal affair between the parties playing out at Taste on Friday, April 5th. The concert begins at 8 p.m. at the College Park restaurant with a $10 admission. The Sunday evening concert at Orlando’s unlikely suburban arts embed, the Timucua white house, supports the release of the duo’s FluiDensity recording. This Jazz On Edge concert has been promised to be largely improvised, keeping with the previous meetings between the trumpeter and pianist. Tags: Brian Groder, Jazz On Edge, Sam Rivers Trio, Timucua Arts Foundation, Timucua white house, Tonino Miano. Bookmark the permalink.